Article 24 of the notarial deed drawn up in Polizzi between the Count Giuseppe Cutelli and the first settlers of the new village, Castel Normanno, obliged the count to build a catholic church at his expense to have a place to pray. 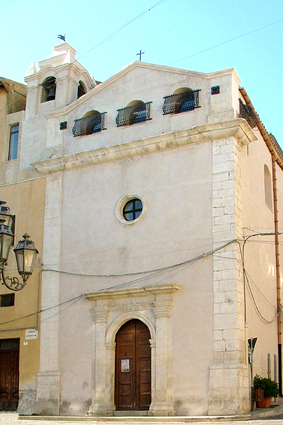 The building of a new church was justified by the fact that the Chapel built by the Baron Antonio Cicala, unofficial founder of the village, turned out to be too small as time passed. His nephew, who was a deeply religious man, kept his word and constructed the sacred building as a simple but worthwhile project. Its original profile can still be admired in the existing façade restored a century ago. It was also modified in order to make space for the provincial road and in part to meet the demands of the convent nuns. the Crucifix. The construction of the provincial road in 1892 which passes through the village, deprived the church of the flight of steps which conferred it a certain impressiveness. In order to access the church, two or three steps were built in its interior. more majestic church was felt by both the people and the clergy. It was talked about both in public and private. Everyone was willing to give a contribution, either in money or work in order to carry out the great project. The dynamic Countess Cristina Cutelli seized the opportunity and heading a committee of honour gave and collected from all the families (even from the poor ones) a great amount of money. Once she obtained the authorization from the civil and ecclesiastical authorities, in 1743 she began the construction of a bigger and more imposing church than the existing one, based on the ambitious design by Giuseppe Caldara, an engineer from Palermo. On this subject, P. Dispenza wrote: “The construction started and the project referred to a church having a nave and two aisles, a grand hall, a decorated facade, two sacristies next to each side of the apse, two high bell towers and two big chambers at its sides.” But the lack of money forced a reduction in the scope of the project and only a aisleless church was built, containing a bell tower, an oratory for the confraternity of the SS.mo Sacramento and a sacristy adjacent to the right side of the church. It was completed in 12 years in 1755, and dedicated to the Immaculate Conception. It was consecrated by the Bishop Monsignor Gioacchino Castelli in front of the overjoyed faithful. The high altar is adorned by Eucharistic symbols in basso-relievo dominated by a painting of the Virgin and a ligneous statue of Saint Antony of Padua, the patron saint of the town. The side altars are dedicated to the Blessed Mother of Fatima, the Crucified, the Blessed Mother of the Rosary, San Francis of Paola, Saint Cajetan of Thiene and Saint Lucy, virgin and martyr of Syracuse. In 1755 it replaced the Chiesa della Madonna del B. Pensiero as Mother Church. In 1757 it became a parish church. Its first priest was Father Giuseppe Sciarrino, a person of great sense and learning. He was in charge up to 1757.The largest of the four bells was dedicated to Saint Anthony of Padua and it was believed that its strong vibrations kept the stormy clouds and tempests away. The construction is made even more impressive by a series of long semi-hexagonal flintstone staircase. In 1990 the inside of the church was restored and decorated with artistic stuccos. In 1991 the steps and the massive main door were renovated. At the sides of the presbytery you can admire the normal size characters in two paintings which represent two miracles by the saint of Padua: the miracle of the three-day-starving mare kneeling down and adoring the Eucharist and the miracle of the bilocation (being in two places at the same time) of the Saint who went to court to defend his father charged with murder. Both were painted by Attanasio but are considered to be of only modest quality. The Abbot Vito Amico wrote that the Church was dedicated to the saint of Padua to honour the Count Antonio Cutelli. The historian Dispenza seems to be more informed and writes: “the choice of the patron saint split the local people: some suggested Saint Anthony of Padua, others San Francis of Paola and others still Saint Vincenzo Ferreri. Lots were drawn and the name of Saint Anthony came out for three consecutive times”. The Romanesque-Baroque Chiesa della Maria SS. Della Purità or Chiesa Nuova with a nave and two aisles was started in 1845. In this church it is possible to see the great artistic Cross of the Civiletti School. The Chiesa Nuova rose in the center of the new quarter which expanded west to the old part with steep but parallel streets. Finding it difficult to reach the Chiesa Madre, the inhabitants asked for a bigger and more comfortable church. 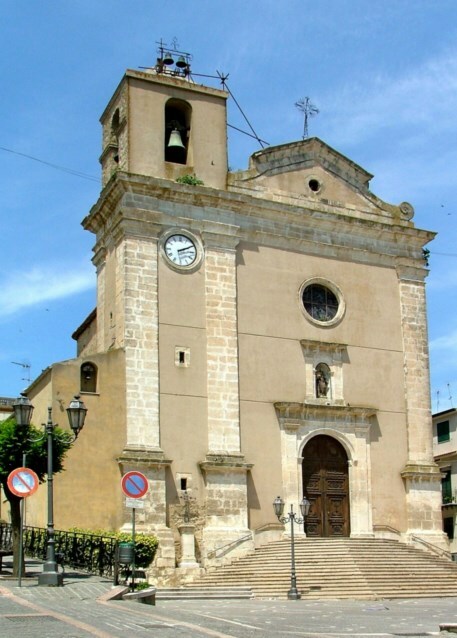 The proposal was strongly supported at the Diocese of Cefalù by the Redemptorist Fathers who had come on mission and claimed that it was right to grant the 2500 inhabitants of the new quarter the honour to have a new church. The bishop at that time was happy to meet the wishes of the believers and without delay he obtained the permission from the Bourbon government to build the desired church. The foundations of the church were laid in 1845. The clergy and the people did their best to provide the material needed for the church. The Baron Lucio Mastrogiovanni Tasca, who was the landlord of the feud of Regaliali, granted 100 onze. Unfortunately, the people had to give up because the expenses after four decades were too much, when the historian Tirrito reached the place for research, the church was still unfinished. The work was completed thanks to the effort of the rectors and the church is today a splendid reality. The most active of these rectors was Tommaso Cappellino who went to the USA to collect money to complete the inside of the church from immigrants who came from Valledolmo. He died at the age of 52, on the day celebrating the feast of Purity, after dedicating his life to the church. He was given a large funeral, and the local authorities named a street which leads to the church after him. His work was continued by his successor Father Vincenzo Barone who restored the two main chapels and the marble flooring of the nave; he also supplied the church with new bells, vestments, altar cloth and holy vessels. In 1937 a young priest from Cefalù, Pasquale Sanfilippo, was named rector. 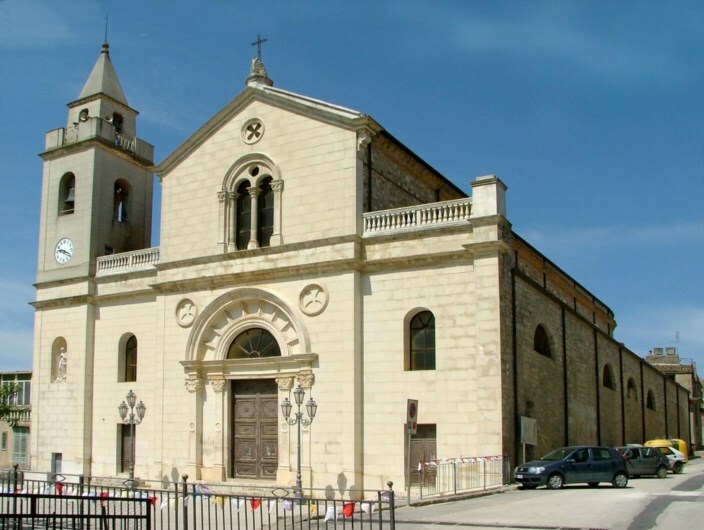 With the help of the Sicilian Region and the contribution of local people he finished all the church renovations hoped for by the inhabitants of Valledolmo in late 1845. He also fixed the church roof, after it was destroyed by a bomb dropped by an American airplane in 1943, and bought a new harmonium and chandelier, and started construction of a cinema as an educational aid for youngsters. disinheriting Giovanni, the natural son of Don Antonio Cutelli. streams and had a capacity of 1364 cubic metres. It is made of stones ( 10,10 m x 38,20 m x 6 m ), with external walls 1,6 meters thick; it has stone cross vaulting arches supported by 6 massive pillars; it is of great historical-architectural value. Amazed after his visit a century later, Turrito wrote: “ this great work cost 16,000 scudos, and owing to the form of its construction it can compete with ones built by the Romans. In 1818 there was a landslide which damaged the big cistern; 4000 lire were spent to repair it, but a few years later a deeper landslide caused damage to the bottom side of the water tank. At this point it was totally abandoned. One can still see the remains of this great work. The stone interior of Stagnone has been recently restored. Today it hosts exhibitions, plays and conferences which have made it famous, attracting people for its great rustic beauty. Baglio Castellana is the feudal palace of Count Cutelli. In the center of the feudal palace, there is a quadrangular courtyard. The building complex also includes the Collegio di Maria with a colonnaded cloister and the Chiesa delle Anime Sante. The two-storey palace stretches 150 metres east. On second floor there was a charming courtyard with columns holding arches under which there were flowerbeds and a well with perennial water near a tree. A small staircase led from the courtyard to the family rooms. Along the northern side of the ground floor, there were tables, barns, storerooms, kitchens and a fountain. A rectangular series of rooms were located in the big courtyard, now called Baglio di Castellana. The way into the Palace and storerooms was through a large and high entrance. In the middle of the Baglio there is a well that collected (and still collects) spring water coming from the surrounding mountains. In front of the entry, there was a ribatteria, a short of farm shop. 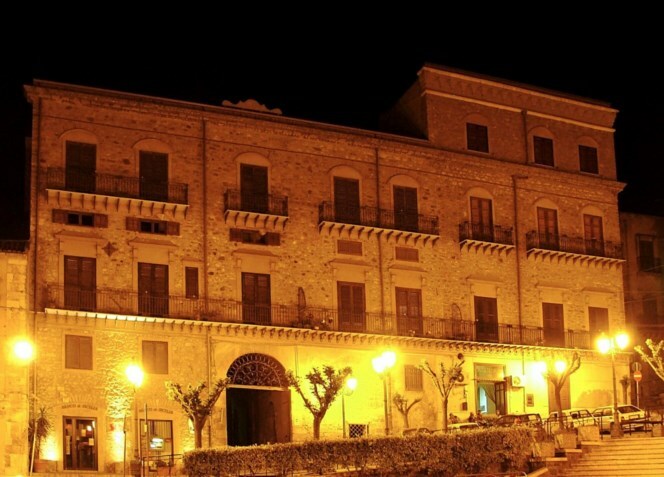 The front palace has been recently restored and it is next to Piazza Madrice where visitors come and admire its beauty. Bronze Bust of Doctor Castrenze Gullo (1902). The monumental work was made by the Palermitan Antonio Ugo. It was wanted by the people to honour the memory of the benefactor. It was placed in the entry of the local cemetery on a pedestal with the following inscription: To Doctor Castrense Gullo, from citizens and friends on the first anniversary of his death placed on XI.V.MDCCCIII. The bust is the only monument erected by the Valledolmesi to honour a local citizen. It represents esteem and gratefulness for a man who died of double pneumonia after assisting a woman in difficult labour on a very cold winter night. He always stood out for helpfulness, benevolence and generosity: he worked as a doctor without sparing himself, helping the people in need and giving them money for the medicine. It is to be remembered that the funeral witnessed the moved participation of women for the first time: according to the custom of the time, only men could go to funeral and women were excluded. Bronze War Memorial dedicated to the eighty young men from Valledolmo who died during World War I. This work was also made by the sculptor Antonio Ugo and placed in the main square of the village. The figures represent a naked soldier holding the image of victory in his right hand and holding a stick in his left hand. It was unveiled in December 1926 before the Prefect Cesare Mori.